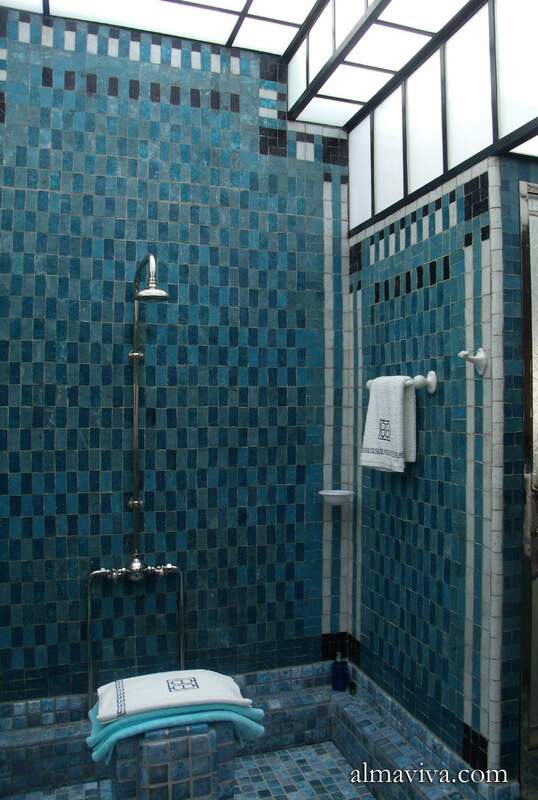 The Paris-based Almaviva studio manufactures handmade tiles that are custom reproductions of old tiles: medieval tiles, pavements of Italian majolica, azulejos inspired by Spain and Portugal, Delft or Iznik tiles, etc. 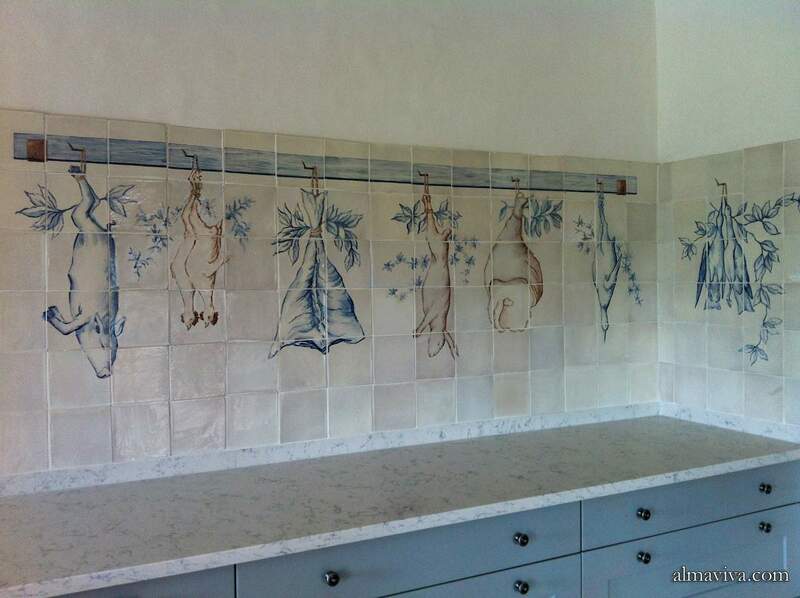 The studio is best known for producing tiles that look the same as the antique ones, but it can also produce tiles looking new, with contemporary decorations. 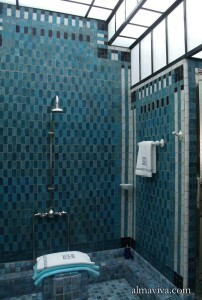 In our showroom located at Montparnasse in Paris, we present tiles with all sorts of patterns. The 19th century is characterized by the industrialization of the methods of production. Stamping the clay by hand is replaced by hydraulic presses that allow manufacturing very regular tiles. The arrival of the gas oven around 1860 allows cooking at higher temperature and the development of stoneware, stronger than earthenware and therefore frost-resistant. 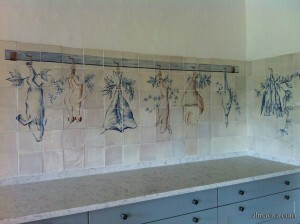 Finally, the decor is no longer just hand-painted, but often reproduced ​​with stencils. 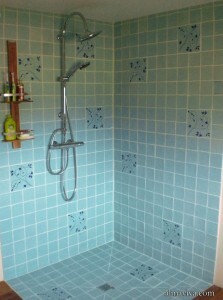 This is the case of Ponchon or Desvres tiles in France. 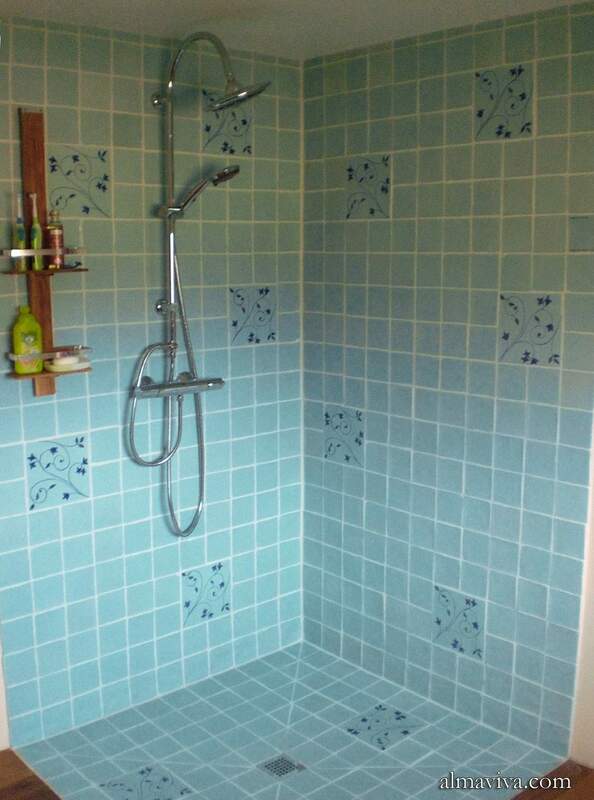 These tiles are used extensively to decorate kitchen walls and backsplashes. 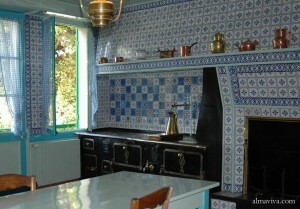 The kitchen of the house of Claude Monet in Giverny is a famous example. The 1890s mark a resurgence in the use of ceramics in architecture, both outside on façade, and indoor with floorings and murals (see Art Nouveau section). The Art Déco period, more sober, had a more limited use of decorated ceramic tiles. However, there are many examples of plain colour tiles with beautiful shaded enamels. The Almaviva studio can make plain colour tiles for modern decors. 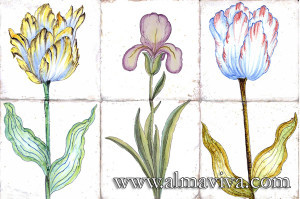 Or tiles related to the past like this trompe l’oeil backsplash inspired by Portuguese azulejos, or these flowers coming from herbarium plates of the 18th century.